After a great deal of questioning Slime Salad users in the forums I have finally come up with a simple gun game. Hopefully this little game can help show others how they can make a gun game of their own. I have commented lots within the games code so everyone should be able to understand how the code works as they read through it. I will be using the coding shown in this game for my own game. I hope everyone is able to see how the ideas in this game can be expanded in to other things like Zelda-esque swords and stuff like that with a bit of tweaking. Thank you everyone who helped me to finally get this thing working. -Due to bullet alignment, if your too close to the top walls the bullet will be destroyed upon firing thus you will not see a bullet when firing. -Walls which stop bullets (Note: due to bullet alignment the walls will destroy the bullet if your hero is aligned over the wall. Sorry I didn't take the time to change this). 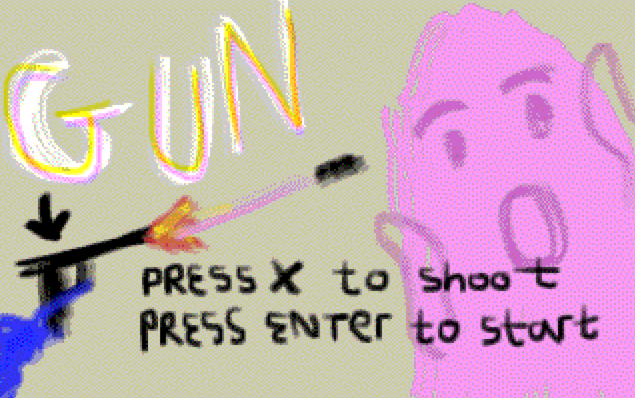 This is a simple shooting game to help show how to make a gun game of your own. No reviews. Be the first to review Gun (Tutorial)!